Well having seen U2 at The Astoria, having won tix in a ballot in a second draw, I guess Lady Luck (with the spinning head) has deserted me this time. Its good to see some fans here have got in. 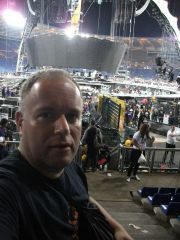 Enjoy it for me and the countless other U2 fans here in London who will be on the outside....somewhere! The Porterhouse is near enough; another fine Dublin export! From the seat plans it looks like RZ is bang in front of The Edge! Agree it is a trade off between queuing all day and seat pricing. Especially if GA split between Pitch 1 and Pitch 2 remains unclear. That said being in the queue provides a great opportunity to meet up with fans. I have the same question re Pitch 1 and Pitch 2. Shows on Dublin seat chart but not Twickenham! Rome 2010 over in Europe!